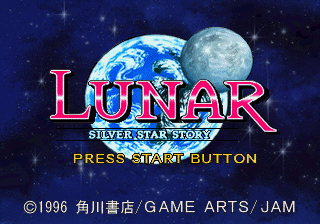 Lunar Silver Star Story (ルナ シルバースターストーリー) is an update to Lunar: The Silver Star released by Game Arts in 1996. It was first released on the Sega Saturn exclusively in Japan before receiving a worldwide release on the PlayStation. It had a sequel, Lunar 2: Eternal Blue, released in 1998. An improved version called Complete or MPEG-Ban (ルナ シルバースターストーリー ＭＰＥＧ版) was released later. The Saturn version sold 115,343 units during its first week on sale in 1996 and went on to sell 200,035 units in Japan overall as of April 1999. The Saturn and PlayStation versions of Lunar Silver Star Story are broadly the same, however without the Video CD Card, all full motion videos in the Saturn version are played at a lower resolution than on the PlayStation. With the Video CD card, the roles are reversed. Being released a two years later later in late 1998, the PlayStation version offers a number of minor enhancements over its Saturn counterpart, including shorter loading times and minor changes to graphics and audio (the logo, for example, has a strip of silver on the PlayStation). In the US, the PlayStation version refers to itself as Lunar Silver Star Story Complete, presumably to highlight the enhancements, though from a gameplay perspective is not thought to be any more "complete" than the Saturn original. Main article: Lunar Silver Star Story/Magazine articles. \TEXT\AR_BOOK.TXT TXT 25,089 Post recording sctipt. AR_BOOK.TXT TXT 25,089 Post recording sctipt.